I believe we all know that I am a bit of a geek… and a geek who loves Star Trek. So I hope you’ll forgive me when I say I’d like to show you a clip from Star Trek. Let me set the scene. Khan has set off the Genesis machine, after a battle with the Enterprise. The Enterprise is damaged, and can’t jump to warp speed to escape. Spock hears this, and heads into the radiation filled warp chamber, and fixes the warp drive, knowing that it will kill him. They escape, then Kirk is called down to the engine room. 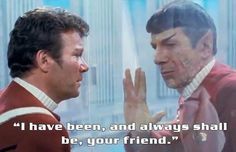 “I have been, and always will be, your friend.” It’s possibly one of the most famous of Star Trek quotes. And it got me thinking – that quote kinda sums up how God feels towards us. He has been, and always will be, our friend. And as I was reading this passage, that’s really what I could see – that no matter what, God has been, is, and always will be our friend. The thing is that we often don’t recognise that. We say that we can’t possibly have God’s love after the things that we’ve done. There are things that I’ve done in my life that I’m deeply ashamed of – surely God can’t love me knowing that I did that. The passage we heard of today tells of the prophet Jonah taking God’s message to the city of Nineveh. That message was “Forty days more, and Nineveh shall be overthrown!” But what do we know about Nineveh? Well, we actually know a fair bit. Nineveh was founded by Nimrod, the first on earth to become a mighty warrior. It was condemned by Zephaniah for its arrogance and forcast for destruction. Zephaniah 2:13-15 tells us that Nineveh will be made into “a desolation, a dry waste like the desert,” where “Everyone who passes by it hisses and shakes the fist.” In the book of Nahum, which is all about the destruction of Nineveh, we read Nahum describe the city as the “city of bloodshed, utterly deceitful, full of booty – no end to the plunder!” By all accounts, Nineveh was evil incarnate, and deserved to be destroyed. And from what we read as well, we can see that people weren’t willing to show God’s love to Nineveh, either. You can see Zephaniah prophesied against it, and Nahum is a whole book celebrating its destruction. When Jonah is told to go and bring a message to Nineveh, he runs away, he doesn’t want to go there. And we read his reason why in chapter 4, “Is not this what I said while I was still in my own country? That is why I fled to Tarshish at the beginning; for I knew that you are a gracious God and merciful, slow to anger and abounding in steadfast love, and ready to relent from punishing.” Jonah didn’t want to go tell Nineveh about God’s message because he knew God wouldn’t destroy them. You look at that and you can see that we do both things. We put ourselves in boxes, and say that we don’t have the right to deserve God’s love. The things we’ve done are so bad that God couldn’t possibly love us. But we also do the same thing as Jonah. That person over there, you don’t want him God. Don’t you know what he’s done? He’s a liar, a cheat, he does this, he is that. Surely, you don’t want Him God. Yet let’s look at how Nineveh, that city of bloodshed, that despised, hated city, who is evil incarnate, is described in the book of Jonah. And you know what – each description there? That’s God speaking to Jonah. God describes Nineveh as a great city. And despite of everything you’ve done, God describes you as a great person. But just because we can be assured that no matter what we do, God loves us, doesn’t mean that we can do anything we want. God still sent a message to Nineveh and that message had a threat of destruction in it. God gave them 40 days, and if nothing happened then Nineveh would be overthrown. So what does Nineveh do? Firstly, the people believed God. The message is shown to us and the first thing we must do is believe. While we may have done bad things in the past, we are always able to stop, to repent, turn around and go in the direction that God is calling us. That’s really what it all boils down to. When we repent, and accept God’s forgiveness, we then start living as Christ calls us to live. To love God humbly, with everything that we have. To love others, showing kindness to them and ensuring that we have justice for all. And to love ourselves – because how can we love others if we do not love ourselves? So today, I invite you to accept the fact that God loves you. There’s nothing you can do to change that. Nothing you can do will change the fact that God loves you, and loves you so much that he sent his son to die for your sins. Just as Spock sacrificed himself, so that the rest of the ship could live, so Christ sacrificed himself so that all who believe in him will live. It’s Christ, there on the cross, saying “I have been, and always will be your friend.” So how will you respond to God’s love? Will you repent of your sins, and turn to follow Christ and how he’s calling you to live – loving God, loving others, and loving yourself? Will you offer that love to others, knowing that God’s love is available for all? I invite you to come and respond to God’s love here today. While we do that, we have this song that says “Lord, I come, I confess” – we need to confess to God of our sins. “Without you I fall apart” – we can’t do anything unless we have Christ with us. “You’re the one that guides my heart” – when we’ve confessed, Christ guides our heart into right action. While we sing, you’re invited to come and confess to God, to come and repent of your sins. Maybe you’re holding onto something that’s stopping you from fully accepting God’s love. Maybe things you’ve said have stopped others from coming to accept God’s love. Maybe you just want to come forward and pray. Someone will come pray with you, or you can bring someone with you if you prefer. But this is your time, to accept the love of God that’s always been there, and turn around and follow Christ.